The night sky. It has enraptured man almost from the beginning of time. What mysteries are held in the movements of the moon, planets, and stars? Photographing the night sky is not a new idea. Photographic images of the moon were first captured in 1839 and 1840 by Frenchman Louis Dagurre and American John W. Draper respectively. Unfortunately both of their images were lost to fire. The oldest known surviving photo of the moon is thought to be the one taken by Samuel Humphrey over the town of Canandaigua, NY on September 1, 1849, However, it is Draper's image that is credited with beginning the age of astronomical photography. Scotland has some of the darkest skies in Europe. A "dark sky" is one devoid of urban light pollution. According to Dark Sky Scotland, "From a city centre location we might see fewer than 100 stars with our naked eyes. Under a dark sky we can see over 1,000 stars. We can even see our own galaxy, The Milky Way, stretching across the sky." The dark skies of Scotland are celebrated with official designations. 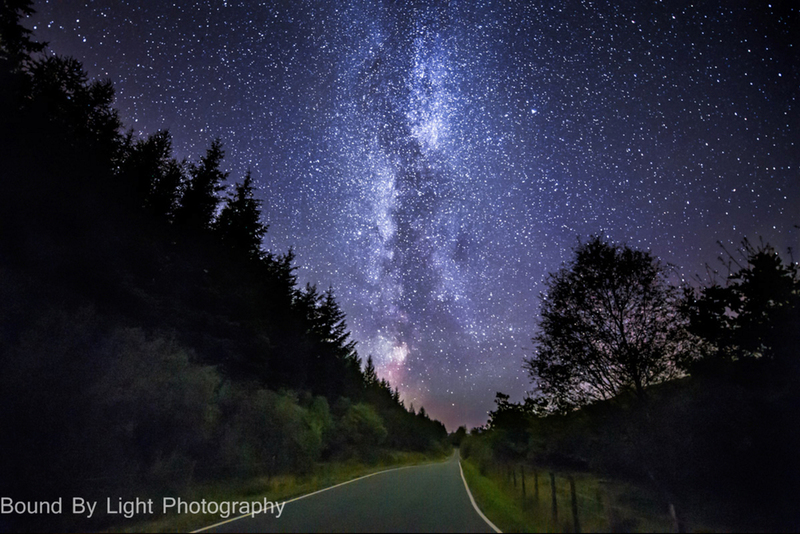 Galloway Forest Park is the only designated "Dark Sky Park" in the UK and one of only three in all of Europe. In 2013 the Isle of Coll became an officially designated "Dark Sky Island" with the nearest lamp post reportedly some 32km away. Scotland even has one of few "Dark Sky" towns in the form of Moffat, in Dumfries and Galloway, where they've adopted special street lights to minimize the urban light pollution. Stuart McIntyre is a Scottish photographer who enjoys the beauty of Scotland's night skies. A PhD who once designed microscopes, he is rapidly developing a specialty in astralphotography (or astrophotography), photographing the night sky. Since 2013, when he first ventured into the night with his camera, McIntyre has spent many a long cold night alone, or sometimes accompanied by his 3-year old daughter Jessica, on a Scottish moor capturing images of one of Scotland's most under appreciated beauties, its night sky. So strong is McIntyre's love of Scotland's night sky that he has created a sideline company to his "day job" as a professional wedding and portrait photographer. He calls it Bound By Starlight and in addition to selling fine art prints of his own work, he offers workshops that range from merely consulting and critiquing others astrophotography, to one-on-one individualized photography outings in the Scottish countryside, in the wee hours of the morning. Already a well known destination for fans of seeing (and photographing) the Northern Lights (Aurora Borealis), McIntyre thinks astrophotography - with Scotland's weather not withstanding - might become a new source of tourism for the country. His work is not just about pretty images. McIntyre often overlays the geography of the night sky, providing an educational element to his work, as in this version of his Glenfinnan image. His favorite image to date? The magic of Glencoe with Scotland's famous Buachaille Etive Mor and the Milky Way. What makes the image especially powerful is the sense of perspective in how the Milky Way dwarfs the mountain, that in turn dwarfs a single human being, another lone astronomer out on the same night this image was taken. Can you find him? Humankind is but a speck in the universe. Can you find the single human being in this image by Stuart McIntyre? For more about Stuart McIntyre's stunning work, about the field of astrophotography, and stargazing in Scotland, please see the following sites. Alex Nail is an award wining British Landscape photographer whose new book “Northwest” features his mountain photography from the highlands of Northwest Scotland. Photographing Scotland is the newest photography guidebook from leading UK publisher fotoVUE. Compiled over 4 and a half years it is the work of award winning Glasgow photographer Dougie Cunningham. Photographing Scotland's night sky could be a source of new tourism for the country and astrophotographer Stuart McIntyre shares his inspiration and experiences in building his company Bound By Starlight.